"It was late afternoon on Cat Island. Atop Mt. Alvernia, the hermitage was perched, under fast-moving clouds," said Jim Austin. "Steps leading up to this monastery were small. Near them was a tomb, where Father Jerome was buried." 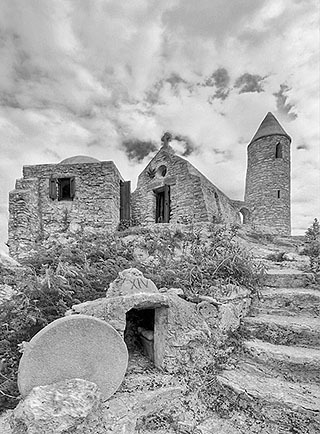 "When Father Jerome arrived on Cat Island, he bought the highest hilltop he could see. It was called Comer Hill, and is, in fact, the highest hill in the Bahamas (206 feet) with a 360 degree view of the island." "Before he died at age 80, Father Jerome hand built this Hermitage out of native rock, and constructed a bell tower, chapel, bedroom, two fireplaces, a cistern, the Stations of the Cross, hand laid steps up a 50 degree incline, and his own tomb. The roman numeral fourteen in this picture represents the tomb of Jesus and the rock at its entrance." Jim used a Canon Rebel XT with a wide angle lens (10mm) and the ISO set to 100. The aperture was f-8.